Carolee is a jewelry company that sells gorgeous necklaces, bracelets, earrings, rings, pins, etc. They sell simple jewelry and very extravagant items like the jewelry seen above. Their items are afforable and gorgeous. I was sent the Make My Day or Night Double Clip Earrings ($38) and the Make My Day or Night Multi Crystal Choker Necklace ($75) to review. I love them both and think they are beautiful. I would wear these to a wedding or suggest for someone to wear them to prom. My sister has her prom coming up and maybe she would like to even borrow these. They are super sparkly and really do look like real diamonds. **I also love this line of blue sparkly jewels. They are absolutely amazing! 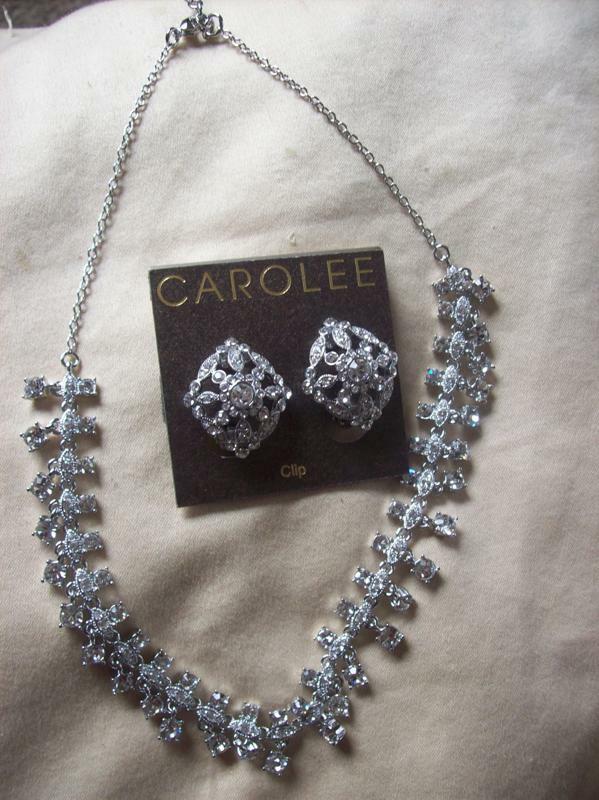 The giveaway will be for the same necklace and earrings that I got to review from Carolee (a $113 value!!). The giveaway is open until Midnight on Tuesday May 10th. Winner will be chosen on Wednesday May 11th using Random.org. The winner will have 48 hours to respond or a new winner will be chosen. Visit the Carolee website and let me know another piece of jewelry that you would love to have. Ohhh my I love the ice blue chocker necklace! LOVE the Romantic Bride Bracelet!!! I have been following your blog for some time and really like it! I love the cluster charm pendant neckace! the ice blue necklace as well! I would also love to have the Cocktail Chic Dramatic Cuff Bracelet! Romantic bride bracelet is beautiful! I would like to have the Golden Paradise Double Row Flower Necklace. I just love the Golden Paradise Tangerine Chandelier Pierced Earrings. I visited the sponsor's website and loved their Sandy Shores Gypsy Hoop Pierced Earrings $85.00. Thank you for hosting this giveaway. I "like" your Facebook page (catalina khalaj). The Luminous Lace Linear Drop Pierced Earrings are stunning! I would love to have the Private Island Turquoise Ornate Chandelier Pierced Earrings. I adore the romantic bride bracelet. Oooh, I fell in love with the sterling silver link bracelet!!!! And I am subscribed by email!!! Woohoooo! I like the Precious Gems Flower Y necklace! I entered the Food Planet giveaway. I would love the Sculpture Garden Three Row Cluster Necklace! I'd love to have the cluster charm pendant neckace. I would love to have the "Vintage Bride Bracelet"
entered the Chef's Planet Kitchen Gadgets giveaway. I LIKE THE LUMINOUS MULTI ROW BRACELET. I'd like to have the Island Breeze Oval Ring. Thanks. I would love the Sterling Sentiments Silver Daughter Bangle Bracelet for my daughter. I think the Romantic Bride Y Necklace is lovely. I would also love to have the The Giselle Crystal Teardrop Pendant Necklace. I entered the Minky Couture Review and $125 Giveaway. I love the Island Breeze Choker Necklace! I love the romantic bride bracelet! I like the silver Mother and Grandmother bracelets. I love the The Tracie Charcoal Crystal and Pearl Charm Bracelet. I'd love to get the Romantic Blooms Flowers Double Drop Pierced Earrings, so pretty! I adore the Island Breeze link bracelet ! Good Price and beautiful !